Still, it’d be nice if SOMEONE would say, oh wow, the way stuff’s not pouring out from under the desk–yeah that–that’s pretty awesome. Not meant to be though. So as I was wrangling dust bunnies big enough to choke a horse out from under my desk, I found this little guy. He really doesn’t have much left in him, poor thing. Once you start sharpening the labelled part, well, it’s getting close to time to start scrambling for a new pencil. It reminded me a of a boy I went to school with–we’ll call him Buck. We were in school together all twelve years. In the early years, we had all our classes together. 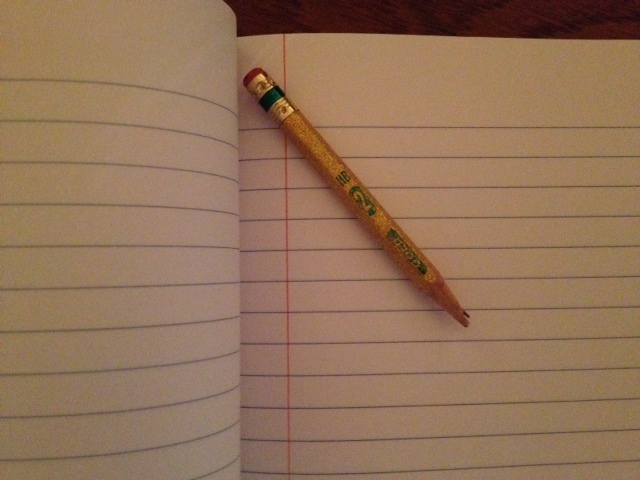 I remember him writing with pencils just like this one more often than not. How he did it, I do not know. But he did. I thought about the short pencil, wondering if Buck always had to use the short ones or if it was his preference. I knew children who often seemed to be short on school supplies. At the time I took it for granted that I never lacked the pencils and notebooks and paper and other supplies required by my teachers. If I had to borrow paper or a pencil it was because of my lack of planning, not because we didn’t have it. Today I realize that my parents made our education a priority, and though we didn’t have a lot of extras, they did make sure we had what we needed. We got new bookbags as needed, but the one I remember most was one Mama sewed for me–two-tone blue denim with all kinds of pockets. Mama did not find much pleasure in sewing but she was an excellent seamstress. That bag held up for quite a while. Today I am thankful for my parents who made choices that assured I was never without what I needed for my education. That was a precious gift because I know there were times that were hard, and they had to cut corners. I am lucky that I never had to worry about how I would get the posterboard for my projects or if I had enough notebook paper to finish the school year. The public schools here start in the next couple of weeks. After finding the pencil yesterday and thinking back over how fortunate I was, I have been thinking about the children who won’t have it so good. Those who will start the school year without the things they need. They start their year already two steps behind. That breaks my heart–the children whose families are affected by the furloughs or whose breadwinners have lost their jobs or who are moving from place to place without a real place to call home. We have the power to change at least this need for them. Many stores have dropboxes for supplies that will be distributed to children in need. Local programs that work with homeless families or spouse abuse shelters, Salvation Army, the Red Cross, Rescue Missions–all of these have children in their midst who could use a hand up as school starts. If you were lucky enough to have what you needed or if you remember what it was like not to have those things readily available, and you are able to pick up a few extra things in the next couple of weeks, will you join me in helping change their future? Let them know someone cares, and send them off on their big day with all the things they need. Nothing opens up possibilities like a fresh box of crayons–so much one can create and do–so full of hope. 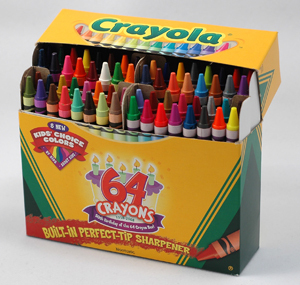 (And remember the boxes with the sharpener built in? Fabulous!) Let’s show them they’re loved. I know it’s a cliché, but these young people whom we have a chance to help today are our future. Let’s make it a bright and hopeful one. We can do it. One pack of paper or box of pencils at a time. Full of hope and potential, just like the children who need our help.